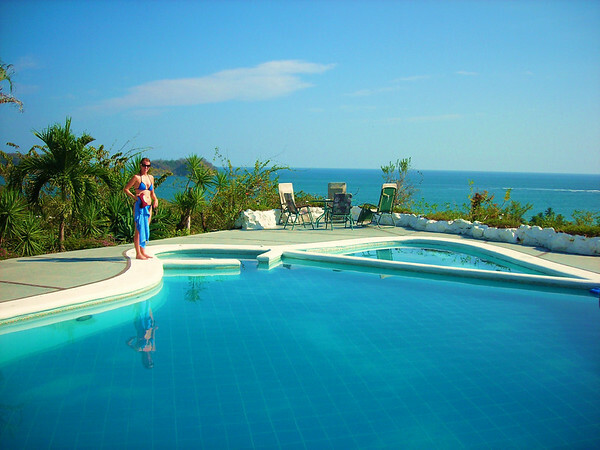 There is an apartment waiting for us at the beach village Samara, $670 a month, it sounds too good to be true. 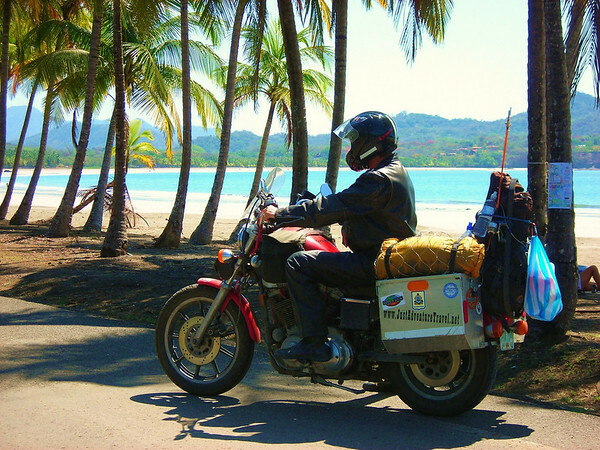 When we first ride into Samara we continue past to Carrillo beach, there we waited for a quote on a place that we read is on the beach. 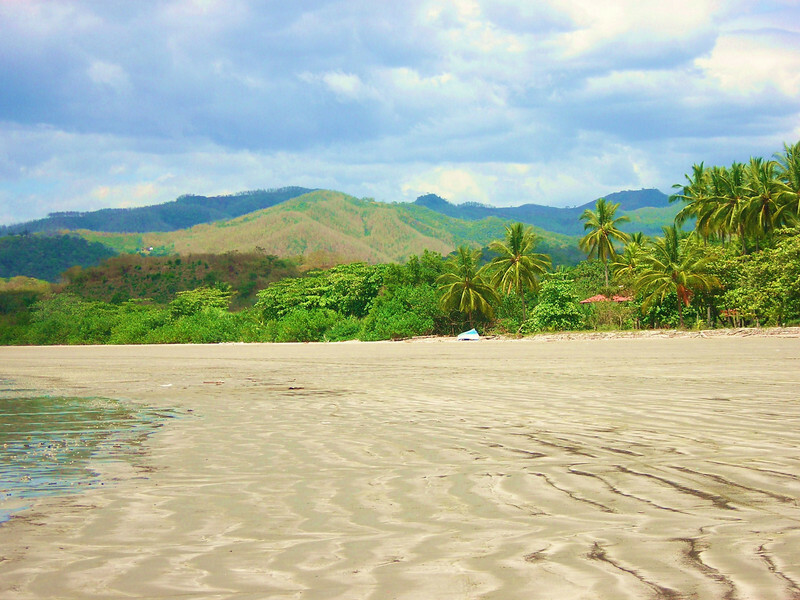 After finding it yes, Carrillo beach is beautiful but the hotel is expensive, dark and not on the beach or even close. At least we gave it a shot. 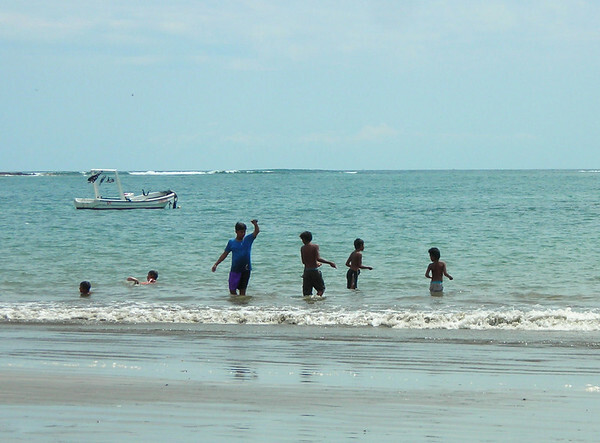 Back at playas Samara we check out the apartment we had lined up. It is nothing special but it looks OK, except the motorcycle security is not good. And the place is in town on a busy street. If we spent a week here everyone will know this bike and that it sits at the hotel most of the time. We can handle one night here but not longer. Just before pulling into Samara I saw a sign "Apartamentos - Piscina - Vista" (Apartments - Pool - View). We ride back and check it out, Holy Cow. This place is over our chosen monthly room budget but This Is Just Too Good. OK, it's $100 a month over our budget, Humm? That's $3.33 a day….. We can make that up. We will cook at home more. We will do more of this and less of that. Heidi and I like to play games with and discuss scenarios about our financial situation. We are always trying to find the funniest reason to afford something that makes sense. "$3.33 a day, that's one cappuccino" Obviously we don't need much to be entertained. The bike looks happy at base-camp. Heidi inspects the pool, "OK!" This works, Playas Samara has hit our mark as being a 'paradise' location and 'Barracuda apartamentos' as being a place where we could live forever. We struck a deal for $33.33 a day (Where am I ?) Only 2 other apartments here are open, the rest are under construction. 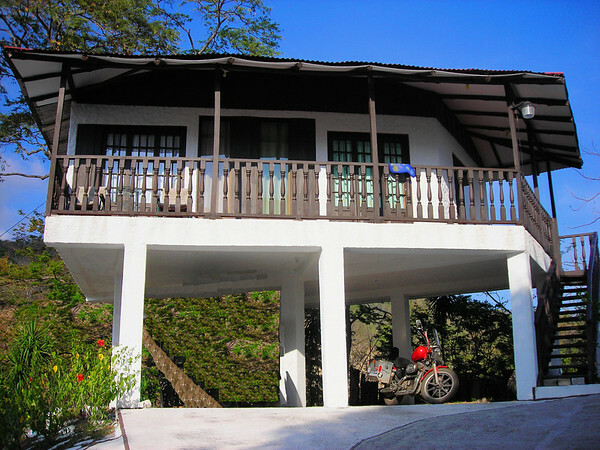 Our unit sits high up on a hill surrounded by jungle and is close enough to the beach to hear the surf. Heidi adds another notch on her belt and 'takes me down' 2 games in a row in water volleyball. This could get out of hand, I must stay focused. 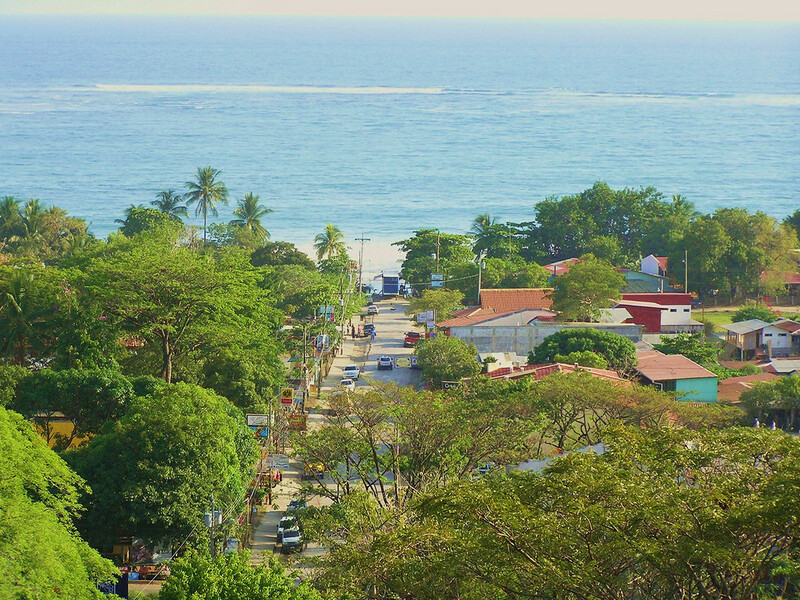 The town of Samara is just a few short blocks down the hill and the beach is a five minute walk through town. The beach is 'nice' with a capital 'N'. There are a dozen open-air beach bars/restaurants facing the ocean, the kind of places where you sit down at a table in the sand under palm trees wearing a swimsuit, bare feet and maybe carrying in a surfboard. 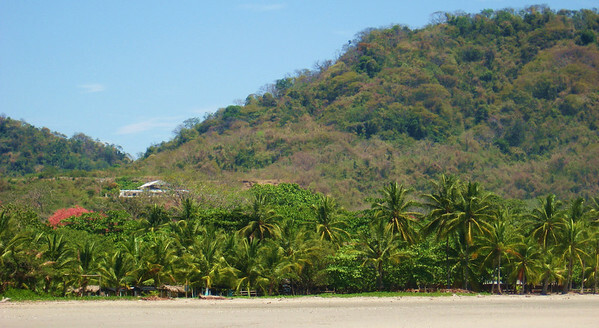 The village is very small but there are several resorts to stay at, in town or on the beach. All the resorts are small family run type and some places look really-really nice. There are also places to camp right on the beach in town, so cool. 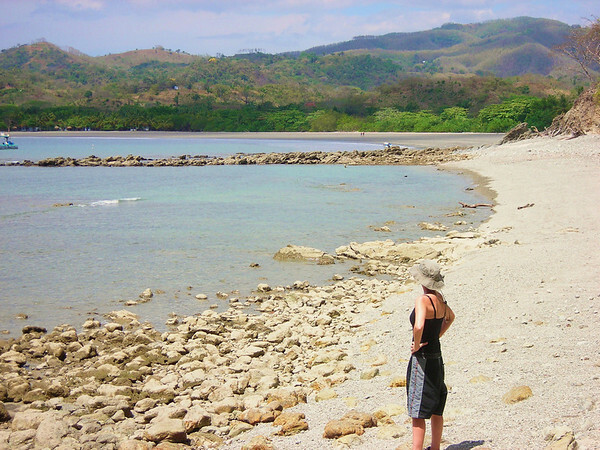 The beach is mostly undeveloped on both sides of town and makes for an ideal hour and a half beach hike. 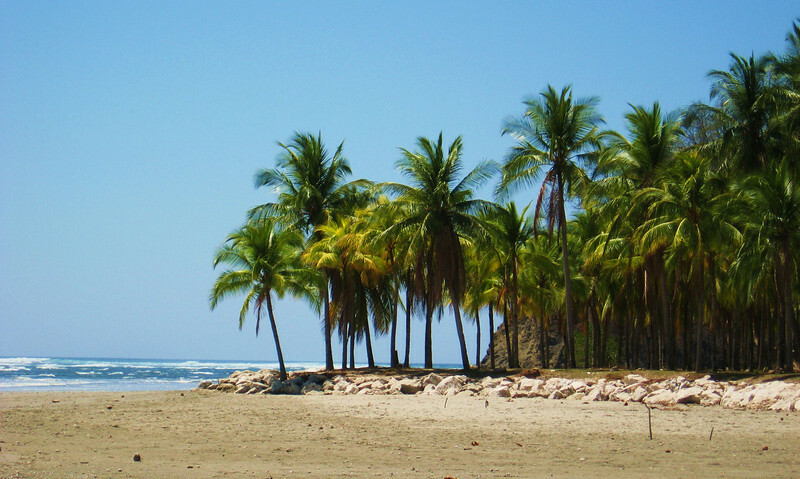 Near town the beach is a buz of activity, rent a surf board or boogie board or lounge in a chair under palm trees while drinking cappuccino or a pina colada. An ice-truck is loading up the holds of these two fishing boats. These guys are going out fishing on the open Pacific. There is only one small outboard motor on each boat. No radios. I wonder if they always go out two's for safety and wonder how long they stay out. Kids fishing. Notice, the three on the right are holding bare fishing line in their right hand. The fourth guy caught something. The Barracuda is highly recommended. 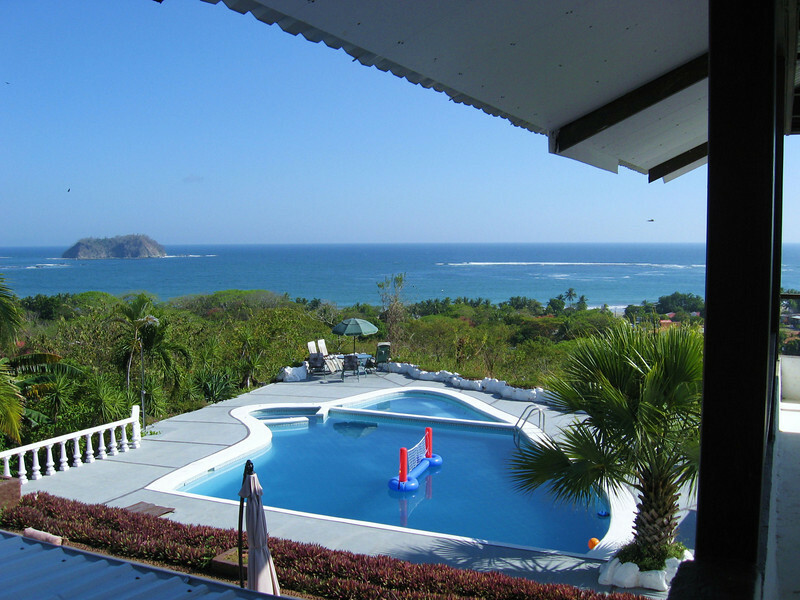 Costa Rica has 'hit the mark' for my vision of a beach & jungle paradise, Heidi to. We can't believe all the places to check out here. We had a hard time getting to several of the places but sometimes that makes it more fun. We have failed to achieve more destinations here then we have conquered, it's all part of the learning process. We have tried several destinations a second time in a different way and have still failed. We are always confident we know what we did wrong and how we will try it again, that is, if we choose to do it again. Sometimes we deem that it is not worth it. Our first failed ride was to a well known cloud forest, Monteverde. We decide to attempt Monteverde again when we get packed up and back on the road. 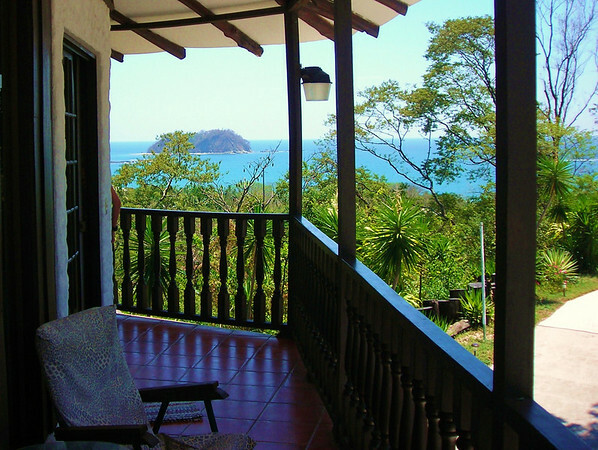 Now, we are devoting all our time exploring Peninsula De Nicoya, the beaches, the raw jungle and protected nature areas. ALERT: This area is an off-road motorcycle haven. Get a good map and get down here with a bike and a tent if you like. There's weeks of free adventure and camping in this area. I would like to take a month to do it. I yearn for a more off-road capable machine. I can do a lot 'one up' lightly loaded on this Sporty but since we've been here I want to take Heidi with me everywhere, and she wants to go. 'Two up' is just a lot tougher especially on the deep rutted severe uphill narrow sandy parts. Heidi has developed new riding signals, like "I'm getting off right here!" or "Let me off!" We talk about "what if we lived here and we both had our dirt bikes" ………………..